Magpul 30-Round Polymer AR mags for just $10.79 each. That’s right — high-quality Magpul PMAG 30s for under eleven bucks. Hard to beat that deal if you are looking for name-brand 30-rounders for your .223/5.56 AR-platform rifle. Click image below to see product info on the Brownells webstore. Share the post "Magpul 30-Round AR Magazines for $10.79 at Brownells"
The U.S. F-Class Nationals, now underway in Raton, NM, are a big success. 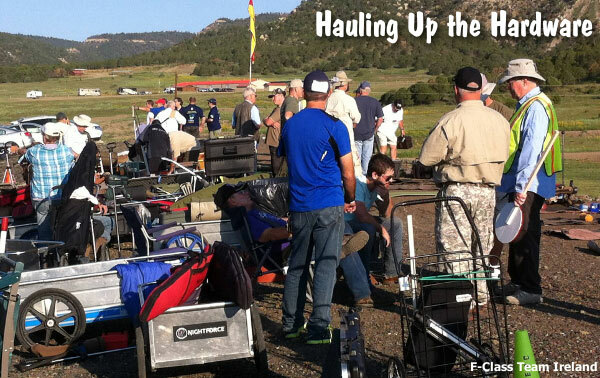 This event has drawn huge numbers of talented shooters from across America (and around the world). 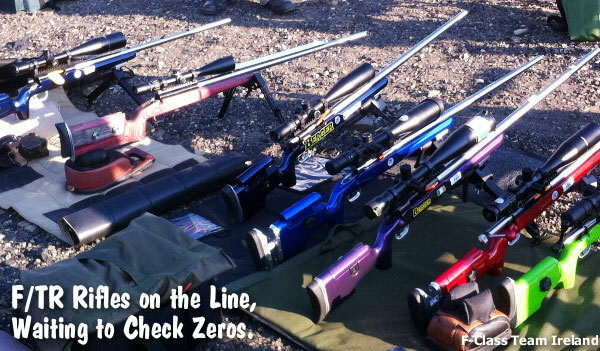 There are roughly 180 F-TR shooters plus over 170 F-Open Shooters. That’s a record turn-out we’re told. The Nationals got off to an impressive start — the best shooters were center-punching the 1000-yard targets right out of the gate. Chris Ford shot a 150-11X in the first F-0pen match of Day 1, when many other 150s were shot, including a 150-9X by Larry Bartholome. Many 150s were also shot on Day 2 during the first match. On both days, conditions got tougher over the course of the day. In F-Open, after two days of shooting, William Wittman (894-39X) enjoys a two-point lead over Larry Batholome (892-42X). In F-TR class, Lige Harris (885-34X) has been the class of the field so far, posting the top scores on both Day 1 (445-18X) and Day 2 (440-18X). The level of competition is extraordinarily high this year — so high that some past National Champions are well down the pack. Overall, if you look at the complete score sheets linked below, you’ll see that competition has been very tight, with many shooters clustered with near-identical scores. 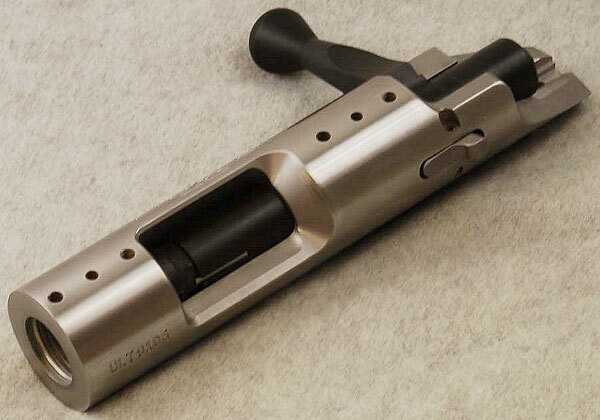 Share the post "Hundreds of Shooters Battle at the U.S. F-Class Nationals"
Jerry Stiller of Stiller Precision Firearms has revealed the final pre-production versions of his new 2500X rear lock-up rimfire action. Jerry reports: “I have eight of them as prototypes that have been sent to our best smiths to build on and test. As soon as we hear back (in a month or so? ), we will start the next run of 100. There will be plenty to go around and should be available this fall for next year’s builds. Cost will be competitive, estimated $1249.00 retail”. Notably, this new action features a convertible 6 o’clock or 12 o’clock firing pin, giving the owner the choice of his preferred configuration. The trigger hanger can also be reversed for a 0.030 change in pin fall. Jerry provided these photos of the first 2500X action off the production line. Jerry notes that: “The only difference with the final production version is that the body will be melonited on the inside for super-slick operation and the outside will still be polished for great looks”. Dual rear locking lugs symmetric about the horizontal centerline. Super tight tolerances on all fitted parts. Firing pin design easily unscrews. 6 o’clock or 12 o’clock firing pin. 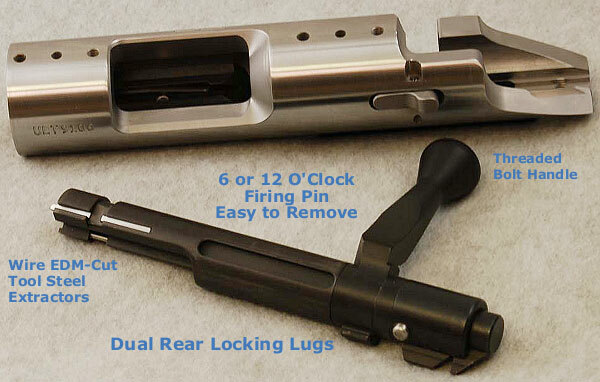 The other pin acts as a guide to eliminate any off-axis canting that can impair ignition and cause flyers. Cocking piece controlled by a shroud so it is always centered in the trigger and cannot rub. Easy loading ramp design similar to the Anschutz. Entrance cams in the body. Four #8 screw holes for scope mounts, plus two #6 screwholes (in between) also reamed for .125 pins. That way a long one-piece mount or just front-only will both be accommodated. Threaded bolt handle so that any available knob will work. Stiller offers three knob types. A multi-step process is employed to deliver precision tolerances on every 2500X action. The process begins with a drilled, undersize hole. Then the body is cut and heat-treated/stress-relieved with oversize outside diameter (OD). The Inside diameter hole is wire-EDM finished after heat-treating for optimal sizing and straightness. Next the OD is ground to size and the action face and threads are machined. The action is finally engraved, hand-finished, and melonited on the inside (unless the customer specifies a non-melonited version). 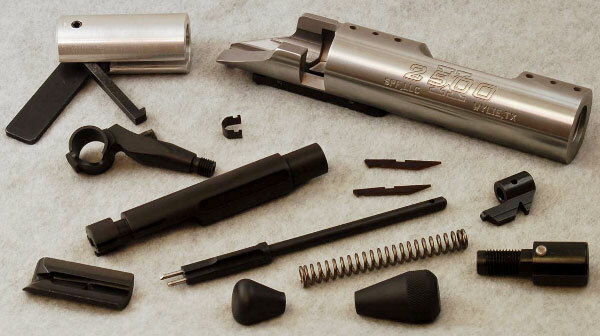 Individual parts receive special attention — the extractors are wire-EDM cut, and the bolt lugs are factory-lapped with special devices to load the lugs as they would be when fired. Share the post "New Stiller 2500X Rimfire Action Revealed — Goes on Sale This Fall"
If you have a match, hunting, or tactical rifle that needs a little more “stiction” in the grip or fore-arm areas, particularly in wet or humid conditions, consider adding a non-slip coating to the stock. This is easily done with inexpensive materials. R+D Precision has a simple do-it-yourself procedure for adding texture to your stock. Be forewarned — this is basically a permanent addition to your stock, so you might want to practice first. Also the application of the bedding compound will change the color of the stock, so you may want to re-finish the stock. Tape off the area you want to put the texture. Spread a very thin coat of the Steel-Bed on the stock, just enough to cover the area. This can be done using Marine-Tex or Steel-Bed. Other products could be used but Steel-Bed is proven, and it’s what R+D prefers for the job. Here is the secret to adding texture: Using the tongue depressor that is in the kit or something similar, BOUNCE the flat part of the stick on the still-wet bedding to get the textured effect. Once the bedding has dried for about an hour, and still kind of tacky, remove the tape, pulling at a sharp angle to leave a nice sharp edge. If the bedding has a sharp raised area where the tape was, wet your finger and rub along the edge and it will knock off the edge but still give that nice sharp transition. Share the post "How to Add Texture to Your Stock Grip and Forearm"